Clinical examination of the neurological system can determine the integrity of an individual's central and peripheral nervous system. For clinicians in the orthopedic and/or sports settings, use of a neurological examination can be integral in differential diagnosis, treatment planning, and determination of what, if any, referrals need to be made to enhance patient outcomes. When pain is in the extremities, it is essential to understand whether symptoms are primarily arising from a peripheral or central tissue at fault. The purpose of this clinical pearl is to describe the clinical reasoning behind using neurological examinations in the treatment of individuals with extremity pain. Prior to performing a neurological examination, clinicians should perform a subjective examination to determine a patient's cognition and report of symptom location, nature, behavior, and severity. 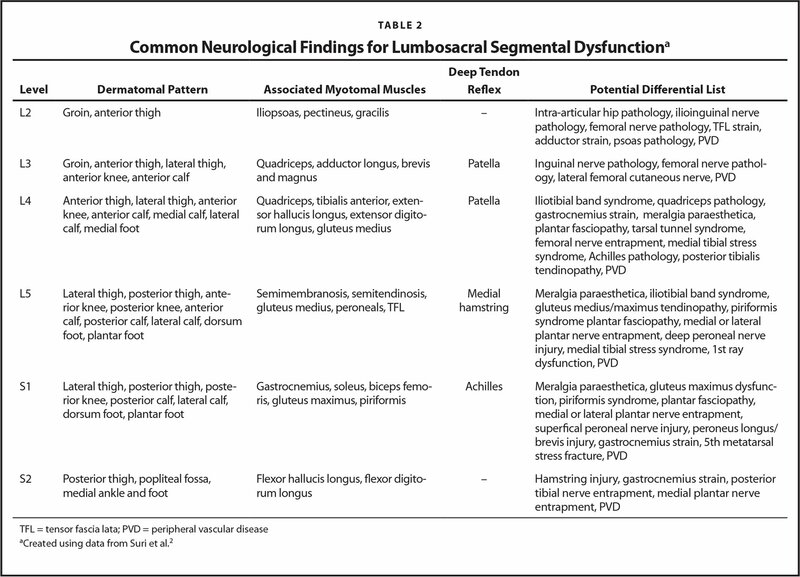 If a patient reports extremity pain or paresthesia, neurologic involvement should be considered, even if symptoms do not follow a typical dermatomal or peripheral nerve pattern. In particular, if patients complain of shooting, burning, or electric shock-like symptoms, a thorough neurological assessment should be performed. When suspecting neural involvement, clinicians should perform spinal screening because nerve roots exit the neural foramen of the associated spinal segment(s). Active range of motion with overpressure assessment, with or without passive joint accessory mobility, can be performed to detect possible spinal involvement. Specific components of the neurological examination should include: myotomal strength, dermatomal sensory assessment, and deep tendon reflexes. Basic neurological screening can help the clinician determine whether further examination for possible upper or lower motor neuron involvement is necessary. Although numerous factors may create variability in testing sequence, a consistent and systematic approach can enhance the reliability and validity of testing. One challenge with screening for neural involvement in the presence of extremity pain is the wide array of symptom presentations associated with the musculoskeletal system. Symptoms related to neural irritation can be mistaken for another condition. For example, lateral shoulder pain is often associated with subacromial or rotator cuff impingement, but may also be related to axillary nerve irritation, C4 nerve root or cervical facet joint involvement, vascular dysfunction, or visceral contributions. Conversely, descriptions of radiating symptoms can be associated with local conditions such as carpal tunnel or pronator teres syndrome. Differentiation through spinal and neurological examination is important because results will guide patient treatment and prognosis. Another challenge associated with the neurological examination is the lack of standardized testing. As inter-tester variability of testing increases, the ability to provide statistical metrics on utility decreases. 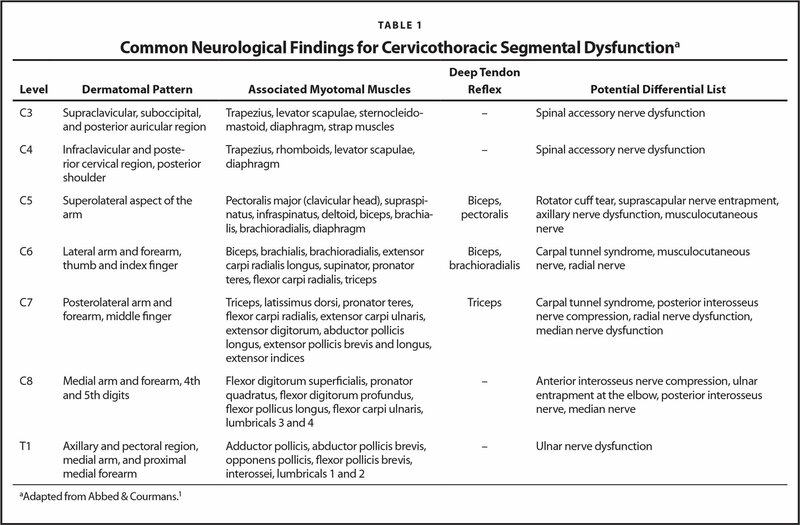 Although available metrics for common neurological examination tests are provided in Table 3,3–5 test results should be clustered to strengthen the presence or absence of dysfunction because individual test results offer minimal guidance for clinical decisions. 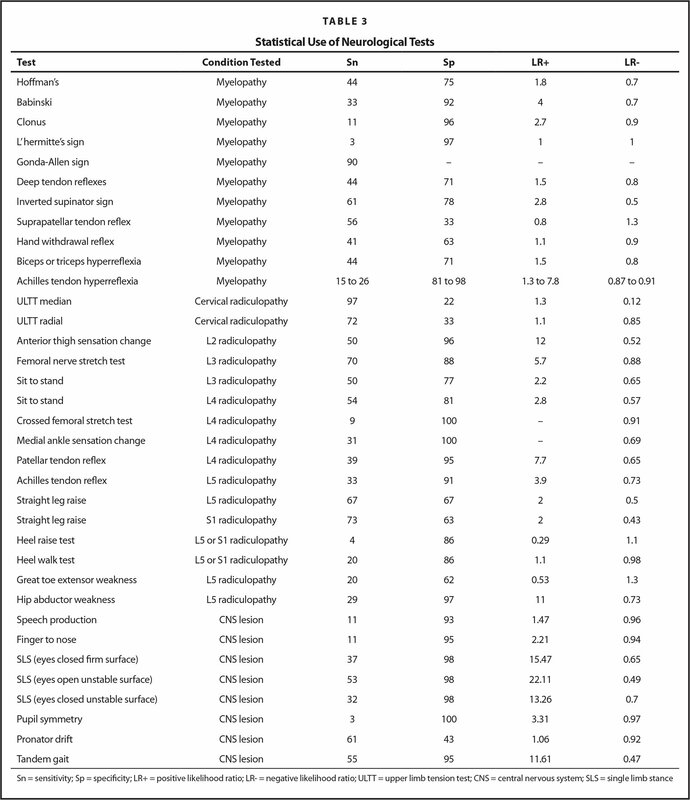 Interpretation of key statistical tools such as sensitivity and specificity (Table 4), which help to make the presence or absence of a condition more or less likely, and likelihood ratios (Table 5), which help to determine the posttest probability, are also presented.6 Until further research establishes more diagnostic information related to neurological examination testing, clinicians should use clinical reasoning to differentiate a condition's upper or lower motor neuron involvement. It is the authors' hope that this “pearl of practice” facilitates this process. Portney LG, Watkins MP. Foundations of Clinical Research: Applications to Practice, 3rd ed. Upper Saddle River, NJ: Prentice Hall; 2009. Sensitivity The test's ability to obtain a positive result when the condition is present (true positive). A negative result for a highly sensitive test suggests the absence of the condition. Tip: ‘SNout rule out’ The upper limb tension test is highly sensitive for cervical radiculopathy (0.97). When this test is negative, clinicians can more confidently believe that the condition is not present. Given its lower specificity (0.22), a positive result does not help rule in the condition. Specificity The test's ability to obtain a negative test when the condition is absent (true negative). A positive result for a highly specific test suggests the presence of the condition. Tip: ‘SPin rule in’ L'hermitte's sign is highly specific (0.97) for myelopathy. When this test is positive, clinicians can more confidently believe the condition is present. Given its low sensitivity (0.03), a negative result does not help rule the condition out. From the Physical Therapy Program, School of Medicine and Health Sciences, George Washington University, Washington, DC (DJJ); and the Virginia Orthopedic Manual Physical Therapy Institute, Charlottesville, Virginia (DJJ, EBL, SER, EMM).